In 2016, the California Legislature made moderate amendments to the Sustainable Groundwater Management Act (SGMA), which go into effect on January 1, 2017. You can find an annotated version of SGMA here, including all the newest changes. Early in 2017, look for a revised version of my earlier white paper on the significant groundwater law, including regulations adopted by the California Department of Water Resources (DWR) and the formation of groundwater sustainability agencies (GSAs) across the state. Senate Bill 564 (Cannella), which added the North Fork Kings Groundwater Sustainability Agency to the list of statutory GSAs. Senate Bill 1317 (Wolk), which would have required cities and counties to establish programs for issuance of permits for new groundwater wells in any high- or medium-priority basin, and prohibited the issuance of a permit in any basin that is designated by DWR as subject to critical conditions of overdraft. Fortunately, it is supposed to rain this week across much of California, so those dark clouds may contribute needed water supplies. Next time you visit my blog, you will see a complete redesign. Hopefully the aesthetic is improved, but the real reason for the change was substantive. The new design allows me to post pages that can serve as long-term resources for readers, rather than revolving blog entries. You will see more of those resource pages being added over the next few months. Common topics will include private water companies, water transfers and markets, infrastructure and sustainable water management. If you have suggestions for helpful resources, please reach out and I may be able to add. I encourage you to visit the LexisNexis Community and check out the other Top 50 blogs that were included. 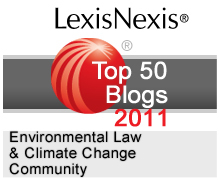 ﻿﻿﻿PrivateWaterLaw Blog has been honored with a nomination for the LexisNexis Top 50 Environmental Law & Climate Change Blogs for 2011. If you’d like to show your support of this blog, please consider submitting a comment on the announcement page by Monday, February 14.